Posted In New Message for You!,New Resources! Debate camp is an invaluable tool for furthering your skills over the summer. But why not combine that experience with interesting excursions, leadership training, networking opportunities with notable people in a range of fields, and the chance to earn over $20,000 in scholarships? In the Four Star Leadership program, you get all that and more. Better yet, it’s FREE for all admitted students! Ready to apply? Get more info and view the application below. Four Star Leadership is an exclusive week-long summer program in July, hosted at Oklahoma Christian University in Edmond, OK. It is sponsored by the General Tommy Franks Leadership Institute & Museum, the National Center for Policy Analysis, the Oklahoma Council of Public Affairs, and Oklahoma Christian University’s Academy of Leadership & Liberty. The Four Star curriculum is designed to expose talented young people to central tenets of leadership, character, and persuasive communication. 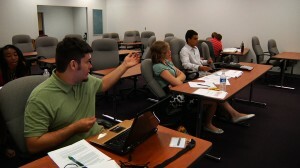 Students prep for their debates at Four Star. Selected students will receive debate training from public speaking specialists, as well as policy briefings from leading national experts on a number of controversial current issues. They will also enjoy numerous enriching excursions, including dinner at the Oklahoma Governor’s mansion, and more! 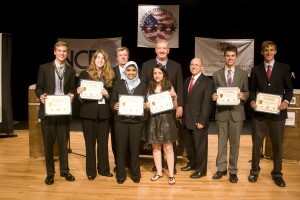 The program includes opportunities to compete in debate, persuasive speaking, and op-ed writing. Winners in these events will earn over $20,000 total in college scholarships for themselves, as well as take home $1,000 donations to their individual schools. Last year’s Four Star debate winners with their scholarship awards. Best of all, accepted students attend Four Star absolutely FREE! Admission includes program costs, travel to the program location, room and board, and all associated fees. You pay nothing to participate. A total of 50 students will be accepted. All applications are due by May 9, 2014 at 5:00pm CT. Questions? Leave them for us in the comments below.